Antigua and Barbuda (/ænˈtiːɡ(w)ə … bɑːrˈb(j)uːdə/ ( listen); an-TEE-g(w)ə … bar-B(Y)OO-də) is a country in the West Indies in the Americas, lying between the Caribbean Sea and the Atlantic Ocean. It consists of two major islands, Antigua and Barbuda, and a number of smaller islands (including Great Bird, Green, Guiana, Long, Maiden and York Islands and further south, the island of Redonda). 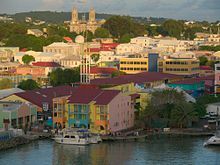 The permanent population numbers about 81,800 (at the 2011 Census) and the capital and largest port and city is St. John’s on Antigua. 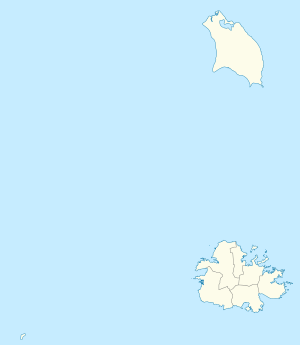 Lying near each other (the main Barbuda airport is less than 0.5° of latitude, or 30 nautical miles, north of the main Antigua airport), Antigua and Barbuda are in the middle of the Leeward Islands, part of the Lesser Antilles, roughly at 17°N of the equator. Antigua and Barbuda remains a member of the Commonwealth and Elizabeth II is the country’s queen and head of state. Antigua is Spanish for “ancient” and barbuda is Spanish for “bearded”. The island of Antigua was originally called Wadadli by Arawaks and is locally known by that name today; Caribs possibly called it Wa’omoni. Christopher Columbus, while sailing by in 1493 may have named it Santa Maria la Antigua, after an icon in the Spanish Seville Cathedral. Most Arawaks left Antigua around 1100 AD; those who remained were later raided by the Caribs. According to the Catholic Encyclopedia, the Caribs’ superior weapons and seafaring prowess allowed them to defeat most of the West Indian Arawak nations, enslaving some and possibly cannibalising others. European and African diseases, malnutrition, and slavery eventually killed most of the Caribbean’s native population. Smallpox was probably the greatest killer. Some historians[who?] believe that the psychological stress of slavery may also have played a part in the massive number of deaths amongst enslaved natives. Others believe the reportedly abundant but starchy, low-protein diet may have contributed to their severe malnutrition as they were used to a diet fortified with protein from the sea. Most of Barbuda was devastated in early September 2017 by Hurricane Irma, which brought winds with speeds reaching 295 km/h (185 mph). The storm damaged or destroyed 95% of the island’s buildings and infrastructure, leaving Barbuda “barely habitable” according to Prime Minister Gaston Browne. Nearly everyone on the island was evacuated to Antigua. Antigua & Barbuda’s population (1961–2010). Number of inhabitants in thousands. 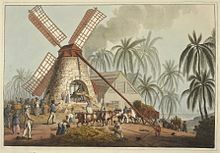 In the years before Antigua and Barbuda’s independence, Standard English was widely spoken in preference to Antiguan Creole. Generally, the upper and middle classes shun Antiguan Creole. The educational system dissuades the use of Antiguan Creole and instruction is done in Standard (British) English. Many of the words used in the Antiguan dialect are derived from British as well as African languages. This can be easily seen in phrases such as: “Ent it?” meaning “Ain’t it?” which is itself dialectal and means “Isn’t it?”. Common island proverbs can often be traced to Africa. (8.2%), Methodist Church (5.6%), Wesleyan Holiness Church (4.5%), Church of God (4.1%), Baptists (3.6%), Mormonism (<1.0%), as well as Jehovah’s Witnesses. Non-Christian religions practiced in the islands include the Rastafari, Islam, and Bahá’í Faith. The politics of Antigua and Barbuda take place within a framework of a unitary, parliamentary, representative democratic monarchy, in which the head of State is the monarch who appoints the Governor General as vice-regal representative. Elizabeth II is the present Queen of Antigua and Barbuda, having served in that position since the islands’ independence from the United Kingdom in 1981. The Queen is currently represented by Governor General Sir Rodney Williams. A council of ministers is appointed by the governor general on the advice of the prime minister, currently Gaston Browne (2014–). The prime minister is the head of government. The current Leader of Her Majesty’s Loyal Opposition is the United Progressive Party Member of Parliament (MP), the Honourable Baldwin Spencer. 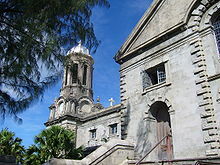 St. John’s parish on Antigua. The elder Bird was Prime Minister from 1981 to 1994 and Chief Minister of Antigua from 1960 to 1981, except for the 1971–1976 period when the Progressive Labour Movement (PLM) defeated his party. Vere Cornwall Bird, the nation’s first Prime Minister, is credited with having brought Antigua and Barbuda and the Caribbean into a new era of independence. Gaston Browne defeated his predecessor Lester Bryant Bird at the Antigua Labour Party’s biennial convention in November 2012 held to elect a political leader and other officers. The party then altered its name from the Antigua Labour Party (ALP) to the Antigua and Barbuda Labour Party (ABLP). This was done to officially include the party’s presence on the sister island of Barbuda in its organisation, the only political party on the mainland to have a physical branch in Barbuda. Antigua and Barbuda is a member of the United Nations, the Bolivarian Alliance for the Americas, the Commonwealth of Nations, the Caribbean Community, the Organization of Eastern Caribbean States, the Organization of American States, the World Trade Organization and the Eastern Caribbean’s Regional Security System. A proportional representation of Antigua and Barbuda’s exports. The twin-island nation’s agricultural production is focused on its domestic market and constrained by a limited water supply and a labour shortage stemming from the lure of higher wages in tourism and construction work. Antigua & Barbuda has a greater than 90% literacy rate. In 1998, Antigua and Barbuda adopted a national mandate to become the pre-eminent provider of medical services in the Caribbean. As part of this mission, Antigua and Barbuda built the most technologically advanced hospital in the Caribbean, the Mt. St. John Medical Centre. The island of Antigua currently has two foreign-owned for-profit offshore medical schools, the American University of Antigua (AUA), founded in 2004, and The University of Health Sciences Antigua (UHSA), founded in 1982. The island’s medical schools cater mostly to foreign students but contribute to the local economy and health care. Antigua hosted eight matches at the Sir Vivian Richards Stadium, which was completed on 11 February 2007 and can hold up to 20,000 people. Antigua is a Host of Stanford Twenty20 – Twenty20 Cricket, a version started by Allen Stanford in 2006 as a regional cricket game with almost all Caribbean islands taking part. Rugby and netball are popular as well. Association football, or soccer, is also a very popular sport. Antigua has a national football team which entered World Cup qualification for the 1974 tournament and for 1986 and onwards. A professional team was formed in 2011, Antigua Barracuda FC, which played in the USL Pro, a lower professional league in the USA. The nation’s team had a major achievement in 2012, getting out of its preliminary group for the 2014 World Cup, notably due to a victory over powerful Haiti. In its first game in the next CONCACAF group play on 8 June 2012 in Tampa, FL, Antigua and Barbuda, comprising 17 Barracuda players and 7 from the lower English professional leagues, scored a goal against the United States. However, the team lost 3:1 to the US. Clare Waight Keller included agave karatto to represent Antigua and Barbuda in Meghan Markle’s wedding veil, which included the distinctive flora of each Commonwealth country. ^ a b Crocker, John. “Barbuda Eyes Statehood and Tourists”. The Washington Post. 28 January 1968. p. E11. ^ Fleck, Bryan. “Discover Unspoiled: Barbuda”. Everybody’s Brooklyn. 31 October 2004. p. 60. ^ “Antigua and Barbuda – Countries – Office of the Historian”. history.state.gov. ^ “Introduction ::Antigua and Barbuda”. ^ Panzar, Javier; Willsher, Kim (9 September 2017). “Hurricane Irma leaves Caribbean Islands Devastated”. Los Angeles Times. Retrieved 11 September 2017. ^ Hanna, Jason; Sterling, Joe; Almasy, Steve (2017-09-06). “Hurricane Irma: Powerful storm blamed for three deaths”. ABS TV Radio Antigua & Barbuda. CNN. Retrieved 2017-09-06. ^ Panzar, Javier (9 September 2017). “Hurricane Irma leaves Caribbean islands devastated” – via LA Times. ^ Antigua, Tara John /. “Hurricane Irma Flattens Barbuda, Leaving Population Stranded”. Time. ^ “Background Note: Antigua and Barbuda”. Archived from the original on 14 August 2007. Retrieved 23 August 2007. ^ “Antigua and Barbuda”. CIA, 2011. ^ “Antigua and Barbuda 1981”. Constitute. Retrieved 20 February 2015. ^ “Caribbean Court of Justice”. International Justice Resource Center. 5 September 2012. ^ Krauss, Clifford; Creswell, Julie; Savage, Charlie (21 February 2009). “Fraud Case Shakes a Billionaire’s Caribbean Realm”. The New York Times. Retrieved 14 April 2010. ^ “American University of Antigua, College of Medicine”. Archived from the original on 22 August 2007. Retrieved 23 August 2007. ^ “University of Health Sciences Antigua”. Retrieved 23 August 2007. ^ “The Open Campus in Antigua & Barbuda”. The Open Campus. The University of the West Indies. Retrieved 16 March 2019. ^ “Antigua & Barbuda – Carnival & Music”. www.geographia.com. Retrieved 9 November 2016. ^ “The Wedding Dress: Clare Waight Keller for Givenchy”. The Royal Household, UK. 19 May 2018. “Antigua and Barbuda”. The World Factbook. Central Intelligence Agency.